Total Nursecall | STL Communications, Inc.
With this scalable and customizable hosted solution from STL Communications, Inc. you can easily and affordably keep the lines of communication between staff and patients crystal clear. The best part? You never have to buy a nursecall system again! The Total Nursecall managed solution turns the capital expense of purchasing a new system into an operating expense, with a fixed monthly rate for the entire term of the contract. New employee? No problem. Simply enter a ticket with STLCOM and we’ll take care of the rest. We take care of everything from installation to ongoing hardware and software support. 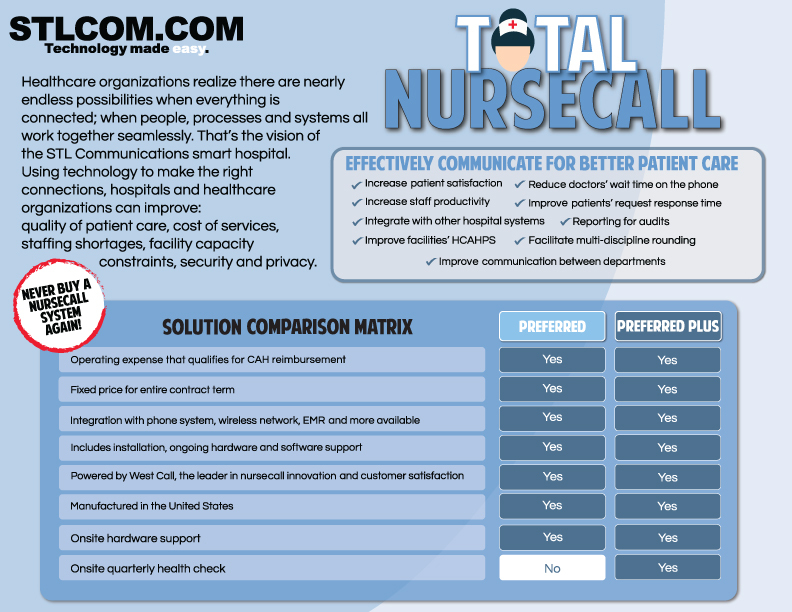 Total Nursecall can integrate seamlessly into phone systems, wireless networks, EMR and more. Let STLCOM take the worries of nursecall technology off of your plate with this hosted solution powered by WestCall, the leader in nursecall innovation and customer satisfaction. 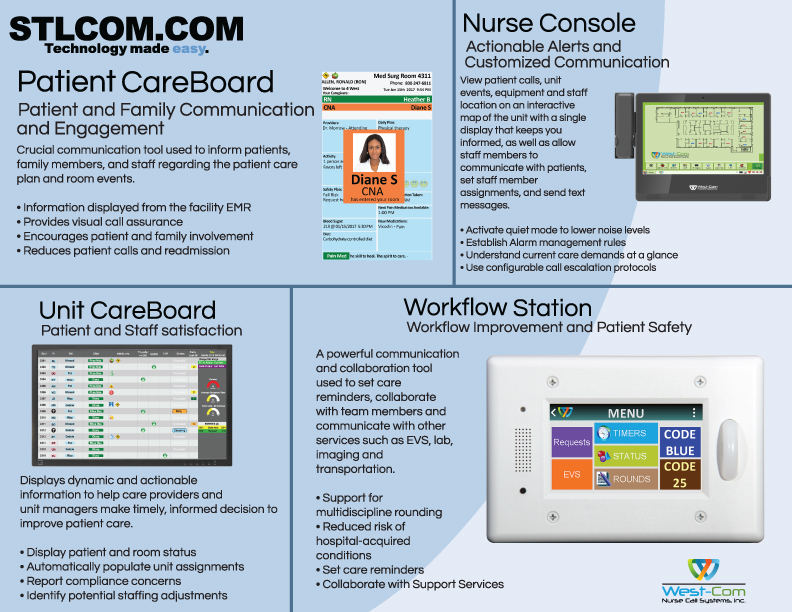 To ensure that hospital staff can stay focused on patient care, WestCall offers an entire suite of tools and products including the patient careboard. The Patient CareBoard™ helps ensure that patients and staff are on the same page. It helps boost staff efficiency as well as keep patients informed along the way by communicating important reminders, updates, current requests and general information to assigned staff. Set schedule for therapy, diagnostics, etc. Click here to download the benefits of working with STLCOM.COM and West-Com!